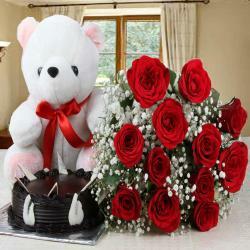 Product Consists: Bunch of 10 Red Roses and 1.5 kg Heart Shape Black Forest Cake along with Teddy Bear (Size : 12 inches). Giftacrossindia.com brings to you this very amazing gift combo for any occasion gifts. This gift combo is all set to delight your special someone on special day and events. Beautiful gift are come in a pristine and charming color that will be a sheer joy to behold without a doubt! You will definitely appreciate the warmth and happiness that this gift combo signifies. This is a marvelous gift for occasions like birthdays, anniversaries, and others. 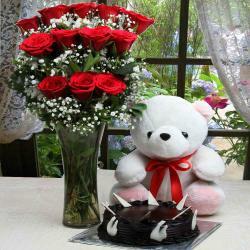 Product Consists: Bunch of 10 Red Roses and 1.5 kg Heart Shape Black Forest Cake along with Teddy Bear (Size : 12 inches).